Before the start of the tournament, India was favorites for most of the experts but Sri Lanka proved every anticipation wrong as they won the 1st T20 by chasing their highest runs in Premadasa stadium. In Today Dream11 Fantasy Cricket Prediction | IND V BAN 2nd T20, we will try to find out whether India will win the second T20 or not? We will also provide all the details of the pitch, playing condition, likely 11, players recent and past performance, what astrology has to say about toss prediction. Who Will Win The 2nd T20, Ind v Ban? Best Team for Dream11 Fantasy Cricket. 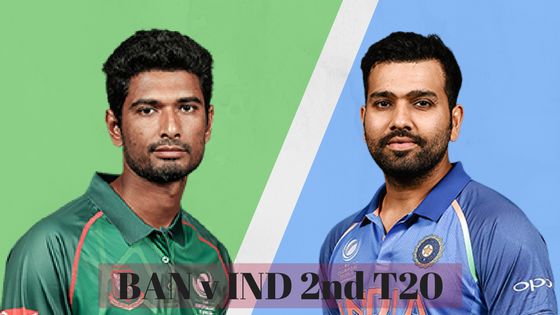 Match: India and Bangladesh in Sri Lanka T20 Tri-series,2018, IND v BAN. Average first inning score is 155. Average second inning score is 132. Highest total on this ground was 205/4 in 20 overs by WI v AUS. In the 1st match, it was clearly seen that there is no support for the seamers from the pitch. The pitch will be slow and help the spinners and slow bowlers. Dew will play important role in the 2nd T20 as well. India has won all the 5 matches played against Bangladesh. The last match they played against each other was in the T20 World Cup in 2016. Let me remind you that the match was a thrilling game and India won the match in the last over. The Maximum temperature is expected to be 30-degree Celsius and minimum temperature is to be 25 degrees. It will be partly cloudy and a stray shower or thunderstorm is possible but this will not affect the game. Rohit Sharma (c), Shikhar Dhawan, Suresh Raina, Dinesh Karthik, YS Chahal, MK Pandey, KL Rahul, RR Pant, DJ Hooda, Mohammed Siraj, AR Patel, V Shanker, SN Thakur, Washington Sundar, JD Unadkat. Mahmudullah(c), Liton das, Tamim Iqbal, Mehidy Hasan, Soumya Sarkar, Nurul Hasan, Imrul Kayes, Nazmul Islam, Mushfiqur Rahim(wk), Ariful Haque, Sabbir Rahman, Abu Jayed, Mustafizur Rahman, Abu Hider, Rubel Hossain, Taskin Ahmed. India may give a chance to Deepak Hooda in place of Rishabh Pant. As the team is playing in the same pitch, Rohit will not change the squad that much. It will be important to see if Siraj gets chance in place of Shardul Thakur. Shikhar Dhawan, Rohit Sharma(c), Manish Pandey, Suresh Raina, Dinesh Karthik, Vijay Shankar, Rishabh Pant/ Deepak Hooda, Washington Sundar, Shardul Thakur, Yuzvendra Chahal, Jaydev Unadkat. Shakib-Al-Hasan has been ruled out of the series because of the finger injury, so Mahmudullah will lead the Bangladesh side. Imrul Kayes/ Liton Das, either of the two may get chance to play. It will be interesting to see how Bangladeshi team responds as they have lost all the 5 matches they played against India. Tamim Iqbal, Soumya Sarkar, Mushfiqur Rahim (wk), Mahmudullah (c), Ariful Haque, Sabbir Rahman, Imrul Kayes/ Liton Das, Mehidy Hasan, Mustafizur Rahman, Taskin Ahmed, Rubel Hossain. Mushfiqur Rahim: Rahim has scored 66 and 6 runs in the last 2 innings he played against Sri Lanka. He has been selected by 59.97% of the dream11 fantasy users. Dinesh Karthik: Karthik has scored 13 runs in 6 balls in the last inning. He has contributed 15.5 points. 40.43% of the fantasy users have selected him. Pro Tips: Both the players are good for the dream11 team but Rahim bats third down for his team and Karthik plays very late down the order so it will be Mushfiqur will be a good option. For multiple teams make a combination from the above list. Rohit Sharma: In last 10 matches Rohit has scored 287 runs with a strike rate of 171. Although he couldn’t score run in the last game but everyone knows his potential. 52.12% of the users have selected him in their dream11 team. Shikhar Dhawan: He is the man to bet on. Dhawan has been consistent throughout in the last couple of months. In the last game, he has scored 90 runs in 49 balls with a strike rate of 183.67. In the last 7 matches, he has scored 320 runs with an average of 45.71. He has contributed 64 points in the last game. 81.99% of the players have selected him in their team for the 2nd T20. Suresh Raina: Raina managed to score only one run in the last inning and has contributed 2.5 points. 71.03 users have selected him in their fantasy teams. Manish Pandey: Pandey has scored 37 runs and contributed 23 points. 60.02% of the users have selected him. Tamim Iqbal: Tamim has scored 29 runs in the last innings he played against SL. He has been selected by 62.52% of the users. Soumya Sarkar: Sarkar has scored 51 runs and took 1 wicket in the last two innings. In the last 10 matches, he has scored 292 runs with an average of 29.20. 53.46% of the dream11 users have chosen him in their team. Pro Tips: Try to keep Rohit, Dhawan, Raina, Tamim, and Soumya Sarkar in your team. For multiple teams make a combination from the above list. Mahmudullah: Mahmudullah has scored 43 and 41 runs in the last two innings. In the last 10 innings, he has scored 240 runs with an average of 26.66. 75.28% of the users have selected him. Washington Sundar: In the last game Sundar took 2 wickets in his 4 overs and contributed with 22 points. 77.6% of the users have selected him. Pro Tips: Try to keep both of the players in your teams as both of them are the valuable player. Yuzvendra Chahal: Chahal took 2 wickets in the last inning and contributed with 21 points. 79.22% of the players have chosen him in their team. Jaydev Unadkat: Unadkat is playing as a lead bowler for India Team. He took 1 wicket in the last match played against Sri Lanka and contributed with 9 points. 67.48% of the users have taken him. Mustafizur Rahman: Rahman took 1 wicket in the last two innings. In the last 7 matches, he took 11 wickets. 65.75% of the users have taken him in their team. Mehidy Hasan: Hasan couldn’t manage to take any wicket in the last match played against SL. 19% of the fantasy users have taken him. Rubel Hossain: In last 7 matches Hossain took 9 wickets. 37.29% of the users have selected him. Pro Tips: Make a combination from the above list for the best dream11 team. On paper, India is a strong team. According to records, India will win the 2nd T20. Our astrology team also predicted that India will win this match against Bangladesh. Our astrology team has predicted that India will win the toss and decide to bowl first as dew will play important role in the match. Conclusion: This is what we have for Today Dream11 Fantasy Cricket Prediction| IND V BAN 2nd T20, if we see any changes in the team we will update on our website. Feel free to give your valuable feedback.